The mandate of Youth With A Mission is: To Know God and Make Him Known. This is our purpose at YWAM Ubon Ratchathani. The heart of the DTS is to bring you into a more intimate relationship with God. It also gives you an opportunity to discover your passions and your part in God's purposes for the world as a messenger of the Gospel. Encounter is an invitation to experience the Living God, Creator of the Universe, and the Pursuer of our Hearts. From before Creation, He has always been, and it is out of His heart of love that all we see was spoken into being. His offer to abundant and everlasting life - to intimate friendship with Himself - has stood from the foundations of the world. And His depth of love in His plans for redeeming all that is lost in our own rebellion surpasses our wildest expectation. The heart of this school is to provide an environment for you to encounter God and equip you to discover and pursue God's purpose for your life. 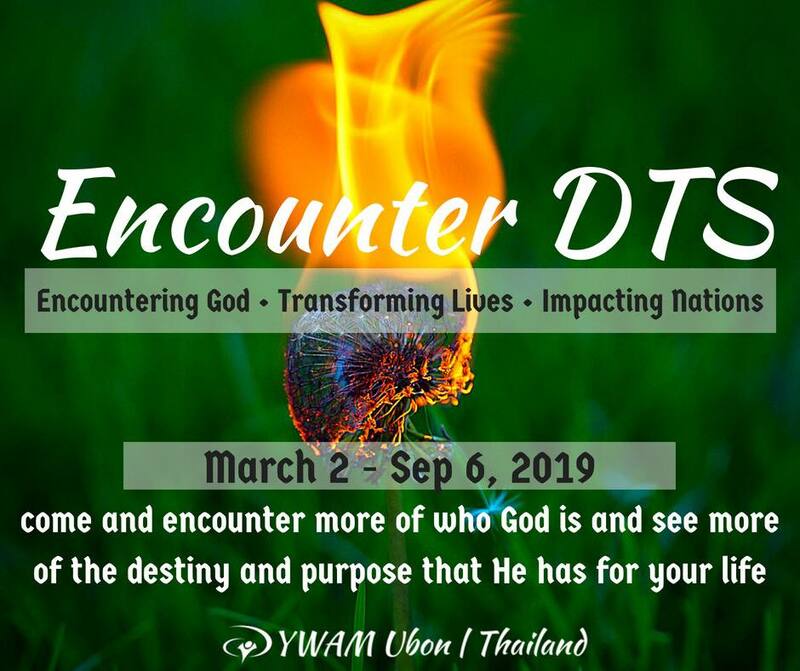 The Encounter DTS has a 12-week Lecture Phase (training) and a 13-week Outreach Phase. The first 6 weeks of the Lecture Phase will be held at our base in the city of Ubon Ratchathani. We then will do a mid-term outreach for about 3 weeks. After this outreach, we will head back to our base to finish the rest of 6 weeks of Lecture Phase. Then we will move into our final 10-week outreach Phase. During the Discipleship Training School (DTS) Lecture Phase, guest speakers will come every week to share on a variety of topics that are designed to help you grow in relationship with God, His call on your life, and gain tools to effectively share your faith. Weekly teachings give you a biblical foundation to understand who God is, what your identity is in Christ, and who we are as His disciples. Each week, a new eye-opening topic will be taught that you can explore in a safe and open community. Times of personal devotion and corporate pursuit of God will give you even more opportunity to encounter His presence and learn the lessons He is longing to teach you. The Outreach Phase focuses on applying what you've learned during Lecture Phase through a cross cultural experience. Students will be given the opportunity to share all of their experiences and new perspectives by sharing God's truths around the world and practicing bold evangelism. Partnering with existing ministries locally during lecture phase and globally during outreach phase will provide for long-term opportunity, while introducing you to different types of ministry. Outreach locations to be announced.